Click here for cache loops. Firebase and standard game. Peter Pig games always cover a narrow period in order to capture that period. Thus the most important aspects of that war can be modelled and the less important ones piled into the general mechanisms. Vietnam from 1955 to 1975. 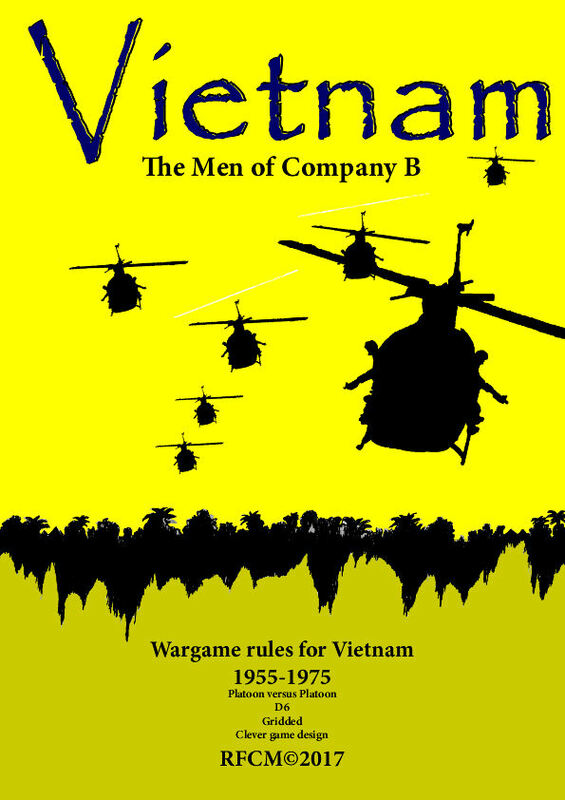 The rules cover the actions carried out throughout this war in Vietnam. This war was between the north and south parts of Vietnam and their political communist and capitalist allies. The VC and NVA are grouped under the heading “communist”. The Australian, US and ARVN forces are grouped under the heading “white star”. Four game types in this book. 3. Mountain tribe fights with the communists. Peter Pig always makes sure that the necessary stuff to play the game is available. Range 1 Vietnam. This range includes buildings vehicles and figures. It also includes figure markers needed for the game. Peter Pig games are never two equal sides "bashing it out". The game allows the players to choose the scenario type. There is no pre-game. Peter pig games should fit on a normal living room table. 5 by 3 feet . The table needs to be marked out with dots to create a 6” grid. Peter Pig games use templates to represent scenery areas. The trees and houses are indicative not literal. Piggy games allow a bunch of D6 to be rolled in order to bell curve the outcomes. Results group around the norm but extremes are possible. 15D6 in total. Typically need 6D6 for actions and 7 D6 for fights. If measuring has to be very accurate, time is wasted and cheating can occur. Grid system. 6" squares. you could measure in multiples of 6" if grids are an anathema. Peter Pig rules use 3x3 cm bases for most troop types. This size is tactile, has the same frontage when turned and allows figure formations to have depth as well as width. Figures are based in pairs. Because formations are not important, the figures can be on 3x3 squares or coins. Base size is not imperative because it is a grid system. Most PP games use about 100 figures a side. enough for PP to make some big sales and not too many to paint. Each player needs to provide about 50 figures. Additional figures are needed for the peasants. Narrow period focus allows "in war" diversity to be modelled. 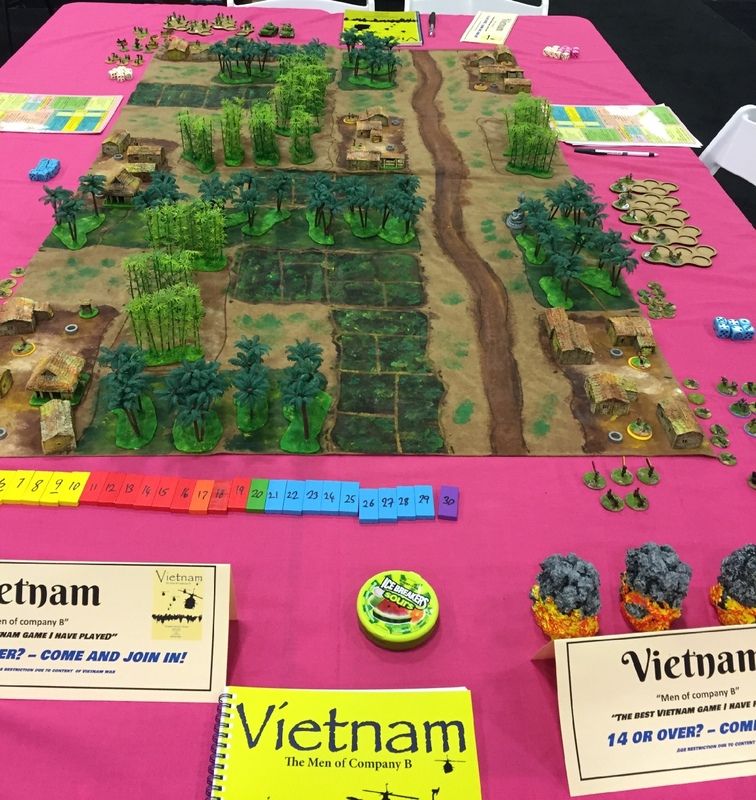 US, Australian, ARVN, VC, NVA and mountain tribes. There must be a reason for the general to be where he is. His presence should make a difference. Units within command distance (2 squares) are allowed more action D6. Something simple that can be memorised. PP rules give a move distance worth having. Unit moves a single square for each successful action. e.g roll all D6 move 1 square, lose 1D6, choose next action, maybe another move? If an action is failed the rest of the player’s turn is reduced to only 1D6 per unit. This creates a decision for players about when to stop operating and when to be bold. Shooting takes into account amount , skill and modifiers but ends up with a bunch of D6. Saving roll gets both players engaged. There is a D6 per base shooting. Less 2 bases on the count if raw. Thus the factors remain constant but the number of bases taking part is the variable. PP fight mechanism only has 2 modifiers. But these are the important ones for that period. Another reason for keeping the period span small. Wiser players often opt to fall back in order to avoid close assaults. Usual mechanic is 4,5,6= fails. 1 fail is not too bad. 3 fails is usually worse news. . A pile of D6. Morale is only taken if enemy in proximity. This is because poor morale does not cause rout (there is nowhere to go) but causes more caution and inaction. Every fail cause the loss of an action D6. Most PP games last 6 turns. Vietnam has a 30 point countdown. Each player removes 1,2, or 3 as he wishes. At zero the game is over. Reinforcements arrive at certain points on the countdown. Vehicles arrive at 25. Last squad arrives at 20 etc. Usually a few numbers to write down at the beginning but nothing after that. Most games have a planning (battle) sheet available as a free download on the PP website. Bookkeeping = tally of VC killed, arrival row, assets chosen. The two sides usually have different criteria to win. Most victory conditions are awarded D6 multiples so their exact worth is not known until the game end. Communists win by killing and delaying the white star units. White star wins by locating caches. Not all PP rules can be played with all figure sizes. usually the rules are written for 15mm. Because the game uses squares as the unit of measurement the base sizes do not really matter that much. What can change is the square size used within the grid. 18/20mm can use the same basing(6 inch squares). 25mm use a single figure to replace a base in 15mm size. 54mm use 8” squares. Single figure instead of base of 2 15mm. PP likes to provide a one stop shop. Bits we like about the game. Action dice system. When do i stop and when should I risk it? Photo by Tom K ex PD! Historicon 2017. Game is about to start.